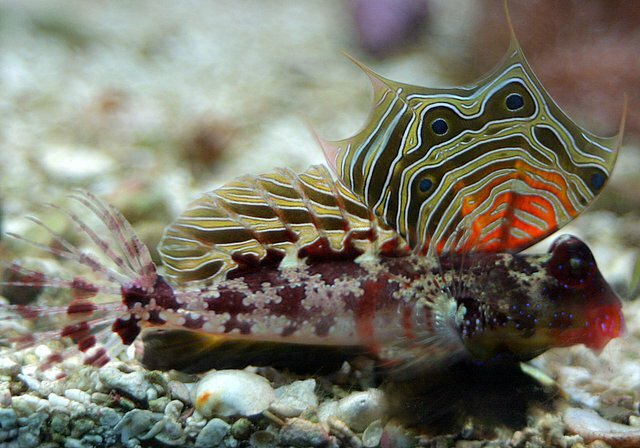 Dragonets are great reef fish but they have special food requirements and unless you can supply them with live pods, most don’t make it. Some will start to eat brine shrimp, Spectrum Pellets, or flake food, but most don’t and even those that do, it’s usually not enough to keep them alive. They can be kept in tanks as small as 40 gallons with plenty of rock work and a good pod population. You can keep more than one in a tank but two males will fight. Males have an elongated first dorsal spine, whereas the female’s is short and squarer looking. They have been breed in aquarium, with the male and female facing each other and then spiraling up towards the water surface. This usually happen late in the day or at night. Basically, if you can’t supply them with a large population of live pods, you shouldn’t think of adding one to your reef tank.